We’re just about starting to see a little hint of Spring and that means it’s almost time to lose the 120 denier tights and get the legs out. I actually love bare legs, although I struggle with how sensitive the skin on my legs is. Being too fair for laser, both waxing and shaving leave my skin so dry and in bad need of some TLC. 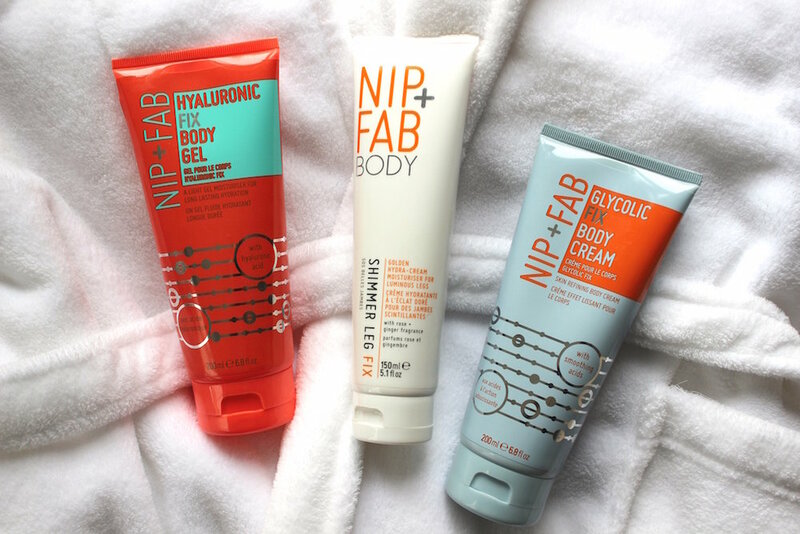 Nip + Fab have some of the most effective leg-loving products I’ve come across and having gone a little nuts on my last trip to Boots, I’m now a die-hard fan! These are my top three Nip + Fab superstar products for silky summer legs. Skin: When I say my legs get dry, I’m talking cracked skin dry and no amount of moisturiser or dry oil seems to make a noticeable difference. I’m absolutely sold on the science bit behind Nip + Fab Hyaluronic Fix Body Gel. With my favourite hyaluronic acid, this gel like formula dries almost immediately, transforming skin that’s dry and a little sad to borderline glossy- I’m seriously impressed by this stuff! Texture: It all comes down to circulation when avoiding the dreaded cellulite. Yes you can be unlucky and just prone to it , but a diet limiting refined sugars can make a massive difference to any problem areas, as can a few decent workouts a week. My routine is to dry body brush the usual suspect areas before showering and then slather on Nip + Fab Glycolic Fix Body Cream. Salicylic acid unclogs pores and aids with resurfacing skin tone while glycolic acid synthesis collagen production promoting skins elasticity. Although not going to work miracles single-handedly, when combined with eating right and staying active it definitely provides a welcome firming element. Also in a lovely gel-like formula, I love that it dries pretty much immediately- I seriously don’t have the patience to stand around sans pj’s waiting for lotions to dry! Finish: Leg prep complete and summer having arrived, Nip + Fab Shimmer Leg Fix is just the thing for a golden glossy sheen more so than hard-hitting science skincare. I do wear tan and find once I’ve applied well in advance (ideally the night before) then layering a little of this liquid gold over legs is fine and wont lift your tan- providing it’s not instant you’re wearing of course. Glowiness in squeezable tube, this will absolutely be one of my 2015 summer essentials! Enjoyed this post? Then stick around! Subscribe to receive updates of new posts, exclusive content, giveaways & freebies!